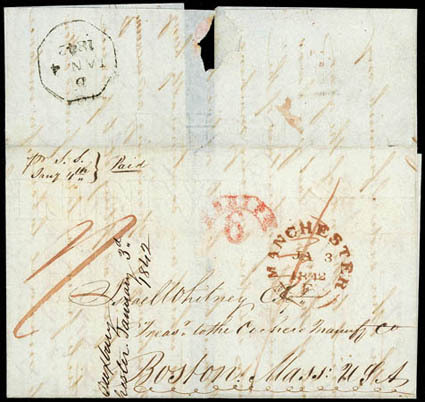 1842 (Jan. 3) Manchester, England to Boston, Mass., folded cover with red "Manchester JA 3 1842" origin datestamp and red manuscript "1/-" shilling prepaid packet rating, Liverpool "D, Jan 4, 1842" octagon backstamp, carried by Cunard Line Britannia from Liverpool Jan. 4th to Boston arriving Jan. 21st, Boston red "Ship/6" fancy ribbon due handstamp; some docketing on face, Fine and rare, ex-Winter. Letter marked one penny in red ink for British inland fee in error and then marked 1 shilling for the packet rate. Liverpool transit octagonal datestamp on reverse has the code letter "D" at the top, a scarce version of the uncommon octagonal marking. Less than a half dozen examples have been recorded and they were used for a three week period from December 1841-January 1842. A link back to Sale 75 - Lot 195, along with its description, will be appended to your message.